For 21-year-old high jumper Morgan Lake and 22-year-old sprinter Dina Asher-Smith, good friends are vital. In the pressurised world of professional athletics, you need people around you who understand that your life is more disciplined than others; and equally, you need fellow athletes around you who know how to cut loose and have fun. That’s how the pair bonded when they first met in 2014, when they stayed in the same hotel room at the European Championships in Zürich, and ended up catching a 2am Uber to a fast food restaurant. As the pair prepare to compete at the European Championships once more, in Berlin this August, Dazed caught up with them to reflect on how it feels to get that personal best they’ve been training for – and why they enjoy the chase either way. “Obviously it’s competitive, so you want to win, but you can take a step back to appreciate that there’s amazing things happening all around you, so it’s really nice,” reflects Asher-Smith. Lake also emphasises how important it is for them to relax during this crucial build-up time: “You can be completely physically prepared to jump a PB, but then you don’t, so that’s where the mental side of it comes in.” They let us in on how they get themselves into that well-prepared state of mind: with manicures, Drake, and social media black-outs. How do you mentally prepare yourself for competing? Dina Asher-Smith: It is such a pressurised environment, there’s more cameras, there’s bigger crowds... That’s when you're more likely to make mistakes. So for me it’s just running through the motions, making sure I’m absolutely focused when I need to be, and I can do what I need to do. Dina Asher-Smith: For me, (it’s also) kind of making sure you are feeling confident before you get there – it’s really important to me, that’s why I do stuff like getting my eyebrows done and my nails done. You can compete in full glam? Dina Asher-Smith: Oh yeah – you compete in full glam, full make-up. Morgan Lake: I actually wear more make-up to compete then I do on a night out. Dina Asher-Smith: Same! I wear far more make-up to compete, the whole fixing spray, everything. It’s because you're on TV, and it’s part of your moment, isn't it? You wouldn't want to be looking dishevelled. Morgan Lake: And putting on your music on, doing your make-up, that just relaxes you even more. What music do you usually have on while you’re getting ready? Dina Asher-Smith: We have similar taste. We both like Beyoncé... That’s probably quite an easy common ground. Morgan Lake: I really like her new album. Drake songs motivate us – I’m quite a big Drake fan. 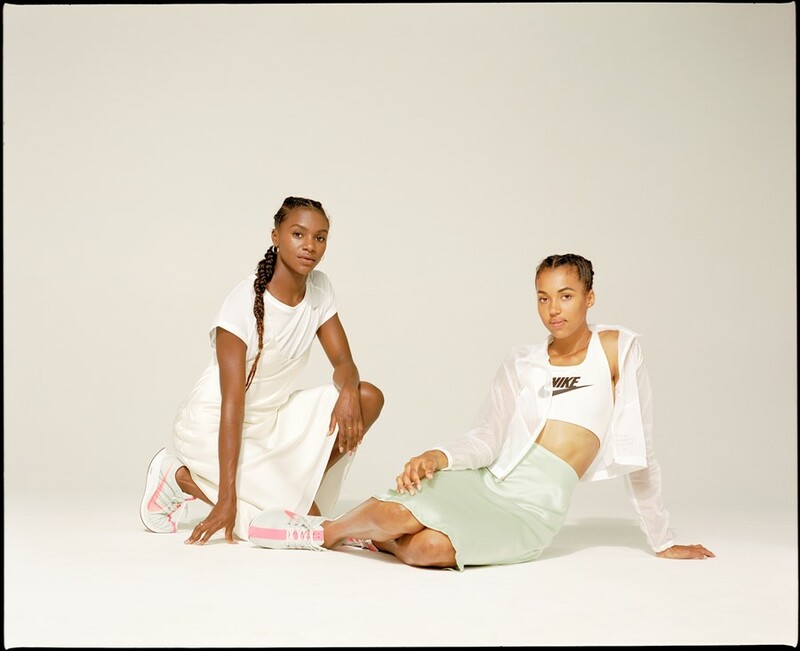 Dina Asher-Smith: And then like British artists. I’ve got a really close affinity to AJ Tracey, Skepta… it’s really heart-warming to see the pride, both in the UK and internationally, in UK artists right now. Because they’ve been amazing for so long, especially Skepta, he’s been iconic in that scene; I see them breaking out of the niche market and becoming far more powerful, it’s really nice to see. It makes you really proud to be from London, ‘cause obviously we've known for ages. Morgan Lake: Now it’s like the whole world can see it. Morgan Lake: I've always been like a huge fan of Serena Williams. She was my biggest role model growing up. She’s such a strong force, she’s amazing. Dina Asher-Smith: Yeah, I'm also saying Serena, ‘cause she's obviously the queen. For me, as a sprinter, Allyson Felix who has won everything, got into Olympics when she was super young, and she's still travelling the world now, it must be over a decade later, which for a woman is so rare. And she does it all with such grace and poise. You’re part of the first generation of athletes who have to think about having an online presence – what’s your relationship like with social media? Dina Asher-Smith: It varies – obviously it’s really useful for building your profile and your brand, but at the same time you have to find that balance between being good at social media but also... ultimately, our success doesn’t come through social media. Our success literally is dictated by what we do on the track. Your followers will go up if you win; if you win at the Olympics, you don’t have to stress about your social media! You mentioned before that you have to stop yourself from comparing your performance to others, does that go for social media as well as real life? Dina Asher-Smith: Normally we do a social media black-out around events. Morgan Lake: Yeah, (recently) there were quite high-profile competitions going on, and people were posting what they’d jumped. It was all was stressing me out, I just didn’t want to have to think about what other people are doing. I’ve got to focus on myself. Dina Asher-Smith: I do (a black-out) at major competitions, especially Twitter, Instagram. People do post really encouraging things, but every now and again… ‘Cause you have to be mentally strong – if you see one negative (post), it has the potential to throw your whole thinking off. It can distract you, when you spent like, a year training for one race. Why was it important to both of you to study for degrees as well as training and competing? Dina Asher-Smith: For us in particular, as women in sport, when we were young we were always told make sure that you’ve got something else. Because you can get one injury and you can be done – but also, even if you’ve done really well, particularly in track and field, sometimes you don’t get paid like the same amount as men. So you do need something else. Once you retire, you’re still gonna have to work. Track and field in particular, it’s so competitive, you can be the best in the world one year, and the next year literally you will not get paid. What was it like balancing uni life with training? Morgan Lake: It’s hard. Yeah, living at a student house during final exams, summer time, which is also peak competition time – the last couple of weeks, everyone’s just been going out, the whole road’s been partying, and I’m just like, “bye, guys!” But my friends do understand – they don’t understand all the time, but you have to keep strong and know that at the end of the day, you’re doing what you love. Dina Asher-Smith: When I was at uni, I was really fortunate that I had friends that just completely understood. They never pressured me to do anything. You’ve just got to appreciate that you’re on a slightly different path than everybody else.